FMR1 antibody recognizes FMR1, also known as fragile X mental retardation protein 1. Mouse anti Human FMR1 antibody recognizes FMR1, also known as fragile X mental retardation protein 1. The protein encoded by FMR1 binds RNA and is associated with polysomes. The encoded protein may be involved in mRNA trafficking from the nucleus to the cytoplasm. A trinucleotide repeat (CGG) in the 5' UTR is normally found at 6-53 copies, but an expansion to 55-230 repeats is the cause of fragile X syndrome. Expansion of the trinucleotide repeat may also cause one form of premature ovarian failure (POF1). Multiple alternatively spliced transcript variants that encode different protein isoforms and which are located in different cellular locations have been described for FMR1 (provided by RefSeq, May 2010). 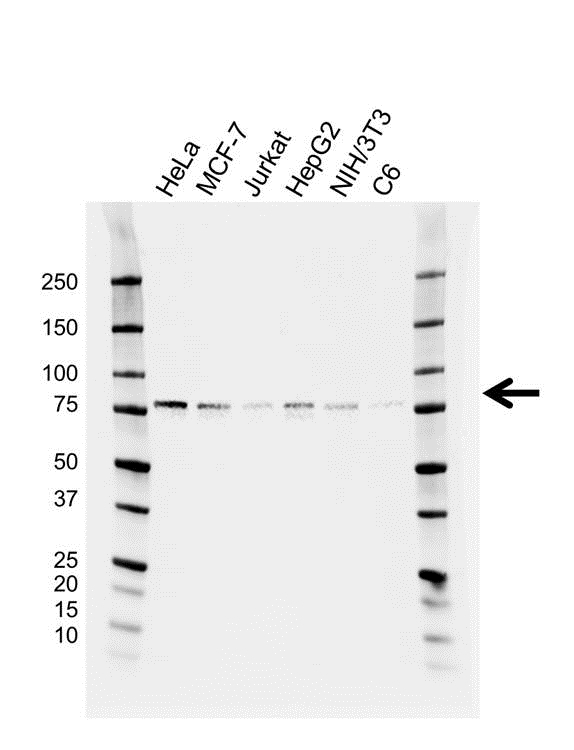 Mouse anti Human FMR1 antibody detects a band of 78 kDa. The antibody has been extensively validated for western blotting using whole cell lysates.